Fall vegetables bring to mind the hearth, coziness, beautiful autumn colors, hearty food and interesting one dish and multi-dish menus. We think about roasting, caramelizing, thick rich stocks, braising and sautéing when we think about the preparation of root vegetables and the other succulent vegetables which brighten up farm stands and markets all over the country at this time of the year. I hope that all of you enjoy Fall Vegetables as much as I do. What’s fun about the change of seasons is that we are forced into creative ways to cook with the new bounty of the season. In this way, your food is never boring and you don’t get stuck eating the same foods day in and day out. Michael Pollan, author of “Omnivore’s Dilemma” and other popular books, has become a figurehead for the local-food movement, which advocates buying in-season produce from nearby farms. Proponents say such food is healthier and that the way it is grown and shipped is better for the environment. But it often is more expensive. Mr. Pollan says the real problem is that subsidies keep the prices of some, largely mass-produced foods artificially low. This is cross-posted at The Fink Farms Dirt. A cabbage harvest in July? That means just in time for outdoor Shabbes dinners, we have the basic ingredient for coleslaw. But with this gem-like vegetable sitting on my kitchen counter, I couldn’t bear the thought of traditional coleslaw: cabbage shreds drowned in mayonnaise and sugar. I decided to celebrate the color. The following recipe is adapted from several sources. A long-time reader of The Jew and the Carrot, it’s easy for me to see the importance and power of conversations within the Jewish community regarding eating, nutrition, food politics, and sustainability. However, the Jewish imperative for justice does not allow us to stop at environmental or personal levels. Rather, we have to continue our pursuit of justice to ensure that everyone has access to fresh, seasonal produce, healthy food options, and the skills to prepare healthy meals. The Nourishing Kitchen of New York City is an organization working to do just that for the East Harlem community. Over the past few years, I’ve developed a host of food intolerances/allergies (still not sure which they are yet, still working on that part) and in addition to making sure I eat healthily, I also have to make sure I don’t eat things that make me sick. The affects of our crazy winter weather are not passed us yet. Generally, we think of bad weather as leading to increases in the prices of food. Examples include, damaged oranges when the temperatures drop below freezing or farmers having to charge more since, they had to remove 3 feet of snow from their potato crops. But this time, the cold winter is going to make your produce cheaper. Florida’s cold weather caused a delay in the harvest date for Florida’s strawberries. The delay caused Florida and California to strawberries to hit the markets at the same time. Last week, 80 million pounds of strawberries were picked – a new record for this time of year. In 2009, a pound of strawberries cost $3.49, while this year strawberries will go for $1.25 per pound. So you promised your boss you would go to work 1/2 day Monday, but you haven’t finished your shopping for the big night. It’s Chicago. It’s winter. OK technically it’s Spring, but we’re all still wearing parkas and fantasizing about the sun returning. And most importantly, the farmers’ market season in Chicago doesn’t really being until April. A little-known gem is thriving right under your L stop in downtown Chicago! Chicago’s Downtown Farmstand, located at 66 E. Randolph Street, is practically under the Randolph/Wabash stop, across from the Millenium Metra Train station, and open 6 days a week ALL YEAR. Zachary Agopian is a chef in Portland, OR and an intern working with an exciting project called Food-Hub: http://food-hub.org/. This project promotes the use of local foods by directly connecting local farmers and ranchers with local buyers. Thanks, Zachary, for sharing this project with us! If you’re like me you’re always on the prowl for the freshest ingredients to nourish your body. Now, this may involve an assortment of ridiculous activities; from a full inspection of your milk aisle for the freshest carton, or the heated family “discussion” over your highly guarded mushroom foraging stash. My personal favorite, over-dosing on peaches until you can’t stand the sight of one until next summer, as to not give-in to the temptation, in the long winter months, of a well traveled piece of fruit. Here in Portland we’re fortunate to have a year-round farmer’s market, and I’m always on the lookout for interesting, tasty, off-the-beaten-path things to make for Pesach. I love serving fresh asparagus at my seder, but it’s not in season yet, so I was looking for an alternative. Our local mushroom purveyor, Springwater Farm, offers a great variety of mushrooms, but they also sell other wild/foragable foods, including fiddlehead ferns and bags of stinging nettles. Here’s a link to some fiddlehead fern recipes. The fiddleheads can be served in lieu of asparagus; just blanch them in boiling water and saute in garlic with a little salt. The month Nisan begins tonight and with it, so many associations. Last year, I wrote about the practice of refraining from eating Matzah from Rosh Hodesh Nisan (i.e. tonight) until Passover. Most people make, if any, the association of dreaded Pesach cleaning and preparation. I’ll be writing some about that in a few days or next week, God willing, but for now, let’s stick to things connected specifically to Rosh Hodesh Nisan. I’ve heard a lot of us Hazon-niks refer to Michael Pollan as Reb Pollan. Yet, as far as I know, he’s never spoken publicly in a Jewish context. Until Tuesday night, that is. Pollan appeared on a panel in Berkeley, just blocks from his home. He was invited not only for the food guru that he is, but as a regular customer of Saul’s Deli, the only Jewish deli in Berkeley. Saul’s is perhaps the only Jewish deli in the country to serve grass-fed meat (at least according to its owners Karen Adelman and Peter Levitt.) Adelman and Levitt talked about how hard it can be to please the old-timers who don’t necessarily care about where their meat comes from, and trying to change with the times. This being the Bay Area, kashrut hardly figured into the conversation, not surprising, since Saul’s isn’t kosher. The event was going to be held at the deli itself, but had to be moved to the JCC to accomodate the overflow crowd. You can read more about the conversation here. So, did you all watch Iron Chef last night? 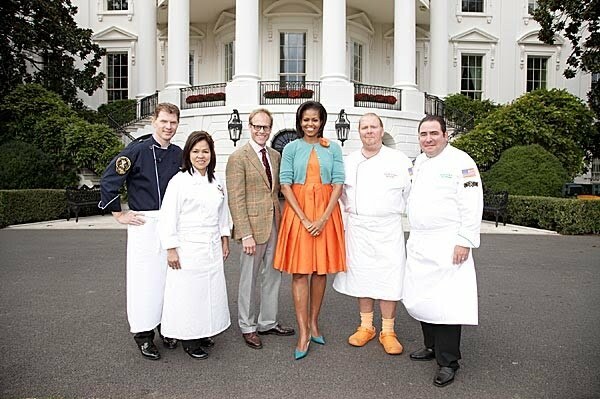 It was touted as a historical battle of super chefs, including Bobby Flay, Mario Batali, and Emeril Lagasse with White House Chef Cristeta Comerford. Their asssignment: to use anything from the White House Garden (and Beehives) to create dishes– locally sourced, organic, sustainable– that would wow America. I reveled in the shots of the lush White House Garden, filmed last October during the full harvest bloom. I marveled at the panoply of professional equipment (and sous-chefs) at the Stadium Kitchen where they held the competition. I learned some marvelous techniques, including blanching and pan-frying icicle radishes to complement scallops (which I don’t eat or serve in my kosher home) and also that professionally trained chefs also have trouble with short pastry. The finished four dishes per team were beautiful to behold. No spoiler here: you could find out about the winning team elsewhere, such as the informative Obama Foodarama website. After eight days of Hannukah holiday feasting, I felt like something was needed to cut all that oil in the system. The edible wild greens that are now in season seemed just the ticket. Edible wild plants have been an essential part of the local diet here in the Galilee going back to the stone age hunters and gatherers. I have learned from neighbors in the nearby Bedouin villages which plants are good to eat, where to find them, and how to prepare them. One of the staples, which is considered a seasonal delicacy, is wild chicory – known in Arabic as elet, and in Hebrew as olesh. It can be found around the edges of fields – a low-growing starburst of scalloped leaves. And it is considered to be extremely healthy – good for “cleaning the blood”, as my Bedouin friends have explained. Going out and gathering is not as commonly practiced in the traditional Arab cultures of the Galilee as it once was – yet the taste for elet remains. Now enterprising farmers have started to cultivate elet and other edible wild plants, and sell them in the local Arab green grocers. Take your favorite latke recipe and substitute an equal amount of shredded parsnips and carrots for the potatoes (if you want them to be even more colorful, you can also add shredded zucchini, if you don’t mind that zucchini isn’t seasonal this time of year for most of us). The result is a lighter, more flavorful latke, and the parsnips and carrots make for a sweeter, more complex flavor than traditional potato latkes. Not to mention you can pretend you’re eating healthier because you’re eating veggie latkes instead of all those carbs (just forget about the whole fried in oil part). Chag sameach!